Way Up South plays music that goes in directions and to places beyond the Southern Rock or Jam Band genres, and has earned them the right to call their music “Big Sky” sound. Incorporating a maturity and musicianship that weaves in and out of southern, blues, country, jazz, and Americana rock songs with precision and finesse, it still retains the loose spacey qualities that are the hallmark of improvisational rock. Listening to one of their many extended jams, you will be transported to those natural wide open spaces in your mind where you can breathe easy and do some soul dancing. 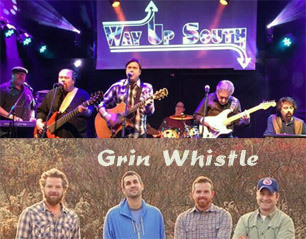 Grin Whistle is a Massachusetts based folk band infusing bluegrass, Americana and roots rock with artful storytelling. The band members are: James Terrasi on electric and acoustic guitars, Noah Hill on drums and percussion, Mark Renczkowski on bass and mandolin and Joshua Hill on acoustic guitar and vocals. They keep emphasis on eclectic and high-energy live performances by melodically combining delicate storytelling with foot-stomping grooves.